This Is Our Brand New Child-Sized Table Chair Set, Which Is A Perfect Center For Toddlers To Enjoy Their Own Eating, Reading, Creating And Playing. Made Of Premium Solid Pine Wood, This Table Chair Set Will Provides You Years Of Durable And Reliable Use. The Colorful Appearance Will Attract The Attention Of Kids And Make Them More Focused On The Task. This Set Also Can Be Used Outdoors So Children Can Enjoy Playtime Outside Or For A Comfortable Picnic Setting. The Colorful Set Is Lightweight So Children Can Easily Transport Their Own Chair. Don't Hesitate To Add It To Your Cart! 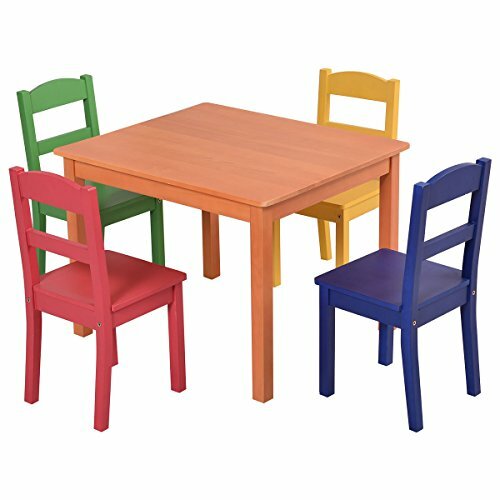 Painted in Natural color ( table) and orange, blue, green, yellow, red (chairs), this set can well-protect your kids' eyes and also add a sense of attraction with this colorful set. It is really a good set for indoor, outdoor use. Don't hesitate to take it home with the reasonable price!